California 37 east reassurance shield posted near Sears Point east of Novato. Photo taken 11/26/04. California 37 is a major route connecting the cities of the North Bay. Starting at U.S. 101 in Novato, California 37 carries two to four lanes across the marshy flats that define the northern shore of the San Francisco (San Pablo) Bay. The highway intersects California 121 at Sears Point, then swings southeast into Vallejo. Passing to the north of that city, California 37 again changes into a expressway/freeway combination as it connects with California 29 and Interstate 80. With a spate of accidents and injuries in the 1990s, California 37 carried the inglorious moniker "Blood Alley," resulting in a higher priority for local politicians to find funding to make California 37 into an expressway and ultimately as a freeway. Currently, sections of California 37 slated for such an expansion, especially in Vallejo, where a new interchange is planned with California 29. The stretch along the marshy north shore is also slated for expansion, but such work requires extensive environmental review due to the preponderance of wetlands in the vicinity. Historically, California 37 was more of a north-south route than east-west route. It used to follow the path now taken by California 121, coming to its northern terminus at California 128 near Lake Berryessa. California 48 covered the stretch of California 37 from Sears Point east to Vallejo. 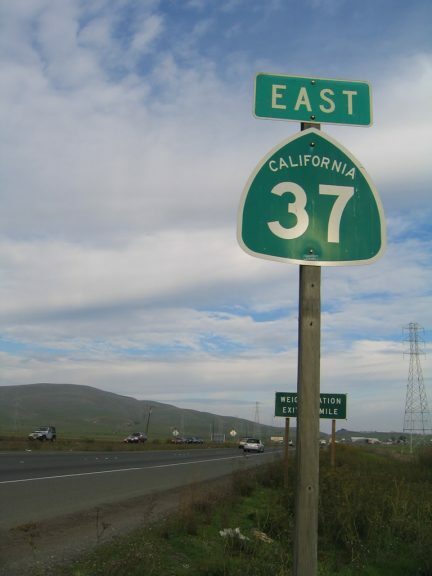 However, in an effort to streamline the north shore corridor with one number, California 37 was rerouted onto former California 48, and it became more of an east-west rather than north-south route. The California 48 designation was transferred to a proposed east-west freeway in the Antelope Valley near Lancaster/Palmdale; the freeway has not yet been constructed. Traffic reporters sometimes refer to the nine bridges of the San Francisco Bay Area. Some of the bridges are easily identifiable, including the Golden Gate Bridge (U.S. 101) and San Francisco-Oakland Bay Bridge (I-80). A few are on a second tier of trans-bay bridges that are less well-known than those two, including SR 84 (Dumbarton Bridge), SR 92 (San Mateo Bridge) and I-580 (Richmond-San Rafael Bridge). Then there are the three Delta bridges: I-80 (Carquinez/Alfred Zampa Bridges), I-680 (Benicia-Martinez Bridge), and SR 160 (Antioch Bridge). That accounts for eight of the nine bridges, and they all carry a common thread of being toll bridges. But when reporters mention that ninth bridge, they are referring to the SR 37 / Mare Island Bridge. This view look south from the Petaluma River Bridge on SR 37 as the river enters San Pablo Bay, as well as a nearby railroad bridge and a distant PG&E power line tower. Photo taken 11/26/04. Looking northwest at the Mare Island Bridge from a vantage point along Wilson Avenue in Vallejo. Photo taken 04/02/04. The Mare Island Bridge is a high span that crosses over the Napa River and allows clearance for tall ships to make their way under the bridge, including those vessels en route to the closed Mare Island Naval Reservation. A smaller lift bridge just to the south of this crossing provides direct access to the former naval reservation. This view looks southwest at the bridge from Wilson Avenue as it passes under SR 37. Photo taken 04/02/04. Southbound Wilson Avenue enters Vallejo Heights just beyond the Mare Island Bridge. Photo taken 04/02/04. Northbound Wilson Avenue approaches California 37 near the eastern end of the Mare Island Bridge. Photo taken 04/02/04.